DVD Copied by Thomas Gideon - Department of Defense. Department of the Army. Office of the Deputy Chief of Staff for Operations. 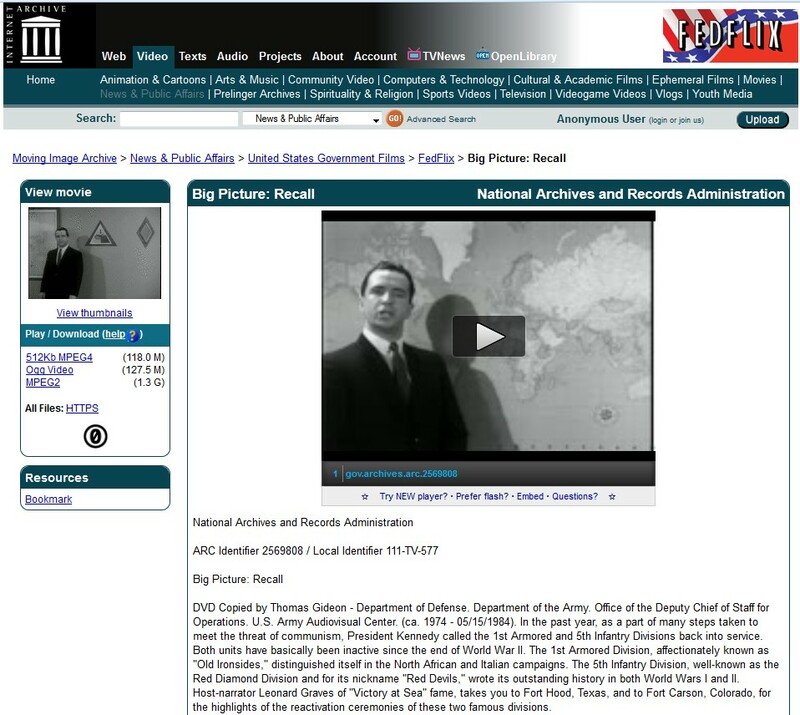 U.S. Army Audiovisual Center. (ca. 1974 - 05/15/1984). In the past year, as a part of many steps taken to meet the threat of communism, President Kennedy called the 1st Armored and 5th Infantry Divisions back into service. Both units have basically been inactive since the end of World War II. The 1st Armored Division, affectionately known as "Old Ironsides," distinguished itself in the North African and Italian campaigns. The 5th Infantry Division, well-known as the Red Diamond Division and for its nickname "Red Devils," wrote its outstanding history in both World Wars I and II. Host-narrator Leonard Graves of "Victory at Sea" fame, takes you to Fort Hood, Texas, and to Fort Carson, Colorado, for the highlights of the reactivation ceremonies of these two famous divisions.